The marriage of Dave’s photography skills with Lisa’s art and computer skills combined with their years of experience working with all ages of people is what makes Lasting Images truly special. 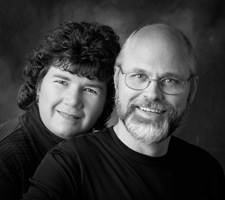 Committed to excellence.David and Lisa Samples of Lasting Images Photography Inc. have been providing Northeastern Colorado with exceptional service and quality for over 25 years. Many things have changed in the digital evolution era and not only have Dave and Lisa ridden the rollercoaster but they have been in the lead. Photographers come and go but Dave & Lisa have a commitment to both their past and future clients. "The session was so fun and relaxing and the pictures turned out AMAZING!!!" "I had a great time during my Lasting Images session. Dave & Lisa were very professional and helped me pick out my best pictures. I had so much fun taking the pictures that I almost forgot why I was there. I would recommend Lasting Images to anybody wanting unique, fun pictures. The hardest part is deciding which images not to keep, they all turned out great!" "We drove 1 1/2 hours to have senior pictures taken. So worth it!! The session was so fun and relaxing and the pictures turned out AMAZING!!! I will be coming back to Lasting Images for many years to come!!!" Dave's eye for the properly lit and exposed image is due to years of education and experience. People can get the occassional cute snapshot but to consistently create beautiful images is truly an art. Dave received his masters degree and craftsmans degree from the Professional Photographers of America. He has had award winning prints displayed in Germany and Korea, as well as various places in the United States including the Epcott Center in Florida. Fourteen of his prints have been published in the prestigious loan collection books published by the Professional Photographers of America. As a result, he was honored with the rare Imaging Excellence Award and Photographer of the Year at the international level of competition. Dave is only one of only a few in the state of Colorado to have achieved this honor at the present date. Dave has served as president of the Rocky Mountain Professional Photographers of America (a five-state region). He has also been a board member of the Colorado Professional Photographers. Lisa creates those incredible finishing touches. Today you cannot achieve success without the computer skills needed in conjunction with the photographic skills. Lisa is our answer to this challenge. Lisa’s knowledge is sought after as she has lectured to other professionals in both Colorado and Wyoming and she continually gets calls from other professionals for her advice. Every day she invents new and exciting creations. Lisa spends many hours a week on research and development of her new creations. Lisa combines her old school art skills with her new school technical skills to create the best artistic images available.